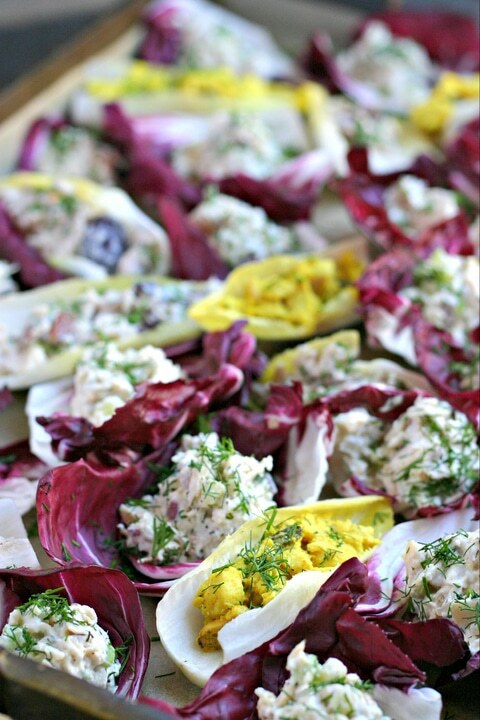 Take the BEST Chicken Salad and stuff it into Endive and Radicchio cups and you have an easy, delicious, healthy and beautiful appetizer that everyone will love! This naturally Low Carb appetizer is perfect for any party! Done in partnership with QFC. How ridiculously gorgeous is this tray? I am dying over how easy this is! This is the party hack we all need in our lives. Something that is basically 10 minutes of work but looks stunning, tastes amazing and is not going to kill the waistline. Essentially, party food that everyone wants to eat. You take the Best Chicken Salad and use a cookie scoop (or a spoon) to load into endive and radicchio cups. Chop some fresh dill and sprinkle all over and you are done. And, it looks like this. Let’s get into the details. I partnered with QFC. to create this bite for you and showcase their new Chef Prepared Chicken Salads. This is an easy way to turn healthy prepared food into fabulous party food without a lot of work. Mix the chicken salads by color and texture to make the tray interesting for your guests. Fresh Dill goes great with all of the salads. If you can’t find that, flat leaf Parsley would be a good substitute. Keep refrigerated until ready to serve. Since these salads have mayo, it is best to make smaller trays (in advance) to put out and continually replenish rather than have mayo sit out for hours. The QFC Chef Prepared Salads are not technically Gluten Free since they are made in a shared facility so make sure to read the ingredient list if you have Celiac Disease or another Allergy. 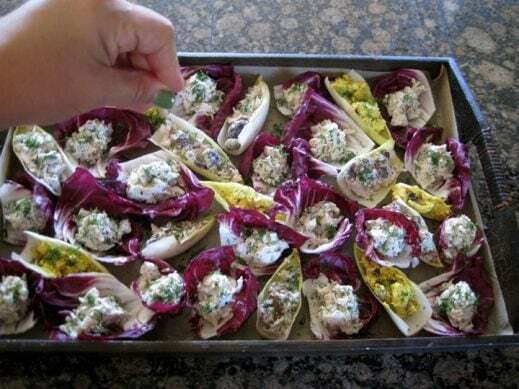 Take the BEST Chicken Salad and stuff it into Endive and Radicchio cups and you have an easy, delicious, healthy and beautiful appetizer that everyone will love! Use 1 pound of chicken salad for each tray of approx. 24 appetizer pieces. Chop dill leaves (remove stems) and set aside. 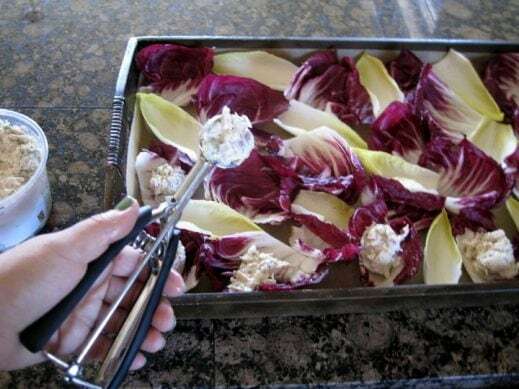 Use a paring knife to cut out the core from the radicchio. Gently peel the leaves off. Trim white tips (very minimally) for a beautiful presentation. Cut ends off of endive and gently peel individual leaves off. Place endive and radicchio cups on serving tray, alternating for color and presentation. Use a cookie scoop or Tablespoon to carefully stuff each cup with chicken salad. Sprinkle fresh dill over all cups. If not using immediately, cover and refrigerate until ready to use. Can be prepared up to 8 hours in advance. Serve and Enjoy! DISCLOSURE: This post is sponsored by QFC. QFC has compensated me for my time to create this recipe and share about my experience with their stores. Thank you for supporting the brands that make EverydayMaven possible. All opinions are my own. This is such an easy and GORGEOUS appetizer! Looks great!! thank you! And I am hoping everyone knows to wash and dry the produce first? Love your creativity I get to use! Yes, I hope so Vicky!